With a stream of product approvals in recent years, the global immunotherapy market has hit its stride. In particular, immunotherapy for cancer is a hot area of research. 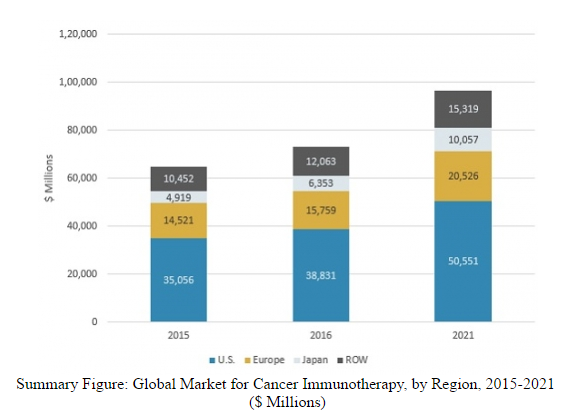 According to BCC Research, the global cancer immunotherapy market should reach $96.5 billion in 2021, up from $73.0 billion in 2016, reflecting a compound annual growth rate (CAGR) of 5.7%. A surge in the use of checkpoint inhibitors, immunomodulatory therapies, and the development of next-generation oncolytic virotherapies are driving this growth. During the forecast period, the strongest growth is projected for checkpoint inhibitors, which are anticipated to have a 19.4% CAGR due to their immense commercial and clinical significance. Immunomodulators are predicted to have the second-highest growth rate among immunotherapy products, with an 8.4% CAGR during the same period. These segments are expected to comprise nearly 33% of the market, with combined sales of $28 billion in 2021. In 2016, the United States accounted for more than 53% of sales ($38.8 billion) in the global cancer immunotherapy market. The United States is expected to remain the global leader among regions with a sustained market share. Europe is predicted to retain its position in second place, with total accrued sales of $20.5 billion in 2021. The most significant growth is forecast in Japan, with nearly twice the growth rate of the rest of the regions due to high-return products and anticipated product launches during the forecast period. Oncolytic virology is the area of research that studies wild-type and engineered viruses to develop therapies for cancer. Oncolytic viruses are claimed to be more selective for cancer cells than for normal cells. Oncolytic viruses can either directly infect and kill cancer cells or recruit the immune system to do the work for them. Thus far, Amgen’s T-VEC (talimogene laherparepvec) is the only approved oncolytic virus in the major pharmaceutical markets. Although oncolytic virotherapy has issues related to mechanism of action, effectiveness, and safety, biotechnology and pharmaceutical companies are attracted to the idea of bringing the next-generation oncolytic virotherapies to market. Instead of directly killing cancer cells, as radiation and chemotherapy do, immunotherapy tells the immune system to act in certain ways by stimulating T cells to attack the disease. However, immunotherapy can cause the immune system to overreact or underreact, Kim said. In addition, cancer cells are evasive and can hide from killer T cells. Aggressive tumors also suppress the immune system in areas surrounding the malignancy (called the microenvironment), keeping T cells out. In two separate projects, Kim’s laboratory focused on how to overcome the immune-suppressive environment created by cancer. One was a biological study to understand and develop light-sensitive molecules that could efficiently guide T cells toward tumors. They discovered that a molecule called channelrhodopsin, which is active in algae and is light sensitive, could be introduced to the immune system via a virus and activated to control the T-cell response to cancer. The second was an engineering study to invent an LED chip to test in mice and to eventually be implanted in humans. For this project, Kim’s lab collaborated with University of Rochester scientists in optics and photonics. The team evaluated their methods in mice with melanoma on the ears. The animals wore a tiny battery pack that sent a wireless signal to the LED chip. This allowed researchers to remotely shine light on the tumor and surrounding areas, giving T cells a boost for their cancer-killing function. The optical control was sufficient to allow the immune system to nearly eradicate the melanoma with no toxic side effects, the study reported. Future studies, Kim said, would determine whether the wireless LED signal can deliver light to a tumor deep within the body instead of on the surface area, and still have the ability to stimulate T cells to attack. Kim emphasized that his discovery is meant to be combined with immunotherapy to make it safer, more effective, and traceable. With improvements, Kim said, the optical method might allow doctors to see, in real time, if the cancer therapy is reaching its target. Currently, a patient must undergo imaging scans several weeks after immunotherapy to find out if the treatment worked. BCC Research’s study, Cancer Immunotherapy and Oncolytic Virology: Technologies and Global Markets, examines factors that are influencing this market from 2016 to 2021. Global market trends are analyzed, with data from 2015, 2016, and projections of CAGRs through 2021. Information is presented on key product segments and advances in technology. Coverage includes the development of therapeutic monoclonal antibodies; kinase inhibitors; cancer vaccines; products based on colony-stimulating factors, interferons, and interleukins; and treatments for oncolytic viruses.